Optimum Opti Clean is an innovative product that will help you clean and protect literally every surface your vehicle has. It's a special kind of quick detailer and waterless wash formula that can also protect any surface you use it on. This product has gotten even better, with stronger protection left behind and an improved uniform appearance with an eye catching shine! Use it on your paint, clear coat, wheels, tires, dashboard, console, doors, trim, windows, and more. Simply mist Opti Clean on the desired surface or a plush microfiber towel and then wipe and you are all done. Fold your microfiber towel in fourths and rotate the cloth to expose a fresh surface for best results. It dries instantly and doesn't leave behind a greasy film like some other options. Utilizing special cleaning agents you can gently clean your entire car. It quickly lifts and separates oils, dust, dirt and other contaminants. The substantive polymers help suspend contaminants so they can be removed safely and you minimize the risk of grinding them into sensitive surfaces. It provides meaningful protection to every surface you apply it to. In addition it will help repel other build ups and it makes future cleanings much easier. Use it on vinyl, plastic, paint, metal, rubber and so much more. The finish will look rich and new with minimal effort. This truly one of a kind product can replace so many other products and take your detailing to the next level. 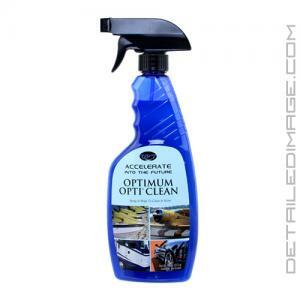 So clean literally your whole vehicle with one product, Optimum Opti Clean. Optimum Opti Clean is a revolutionary product that is specifically formulated to clean and protect all automotive surfaces safely and efficiently without using any water. A combination of substantive polymers and cleaners safely removes dirt and grime and leaves a glossy protective finish on all automotive surfaces. 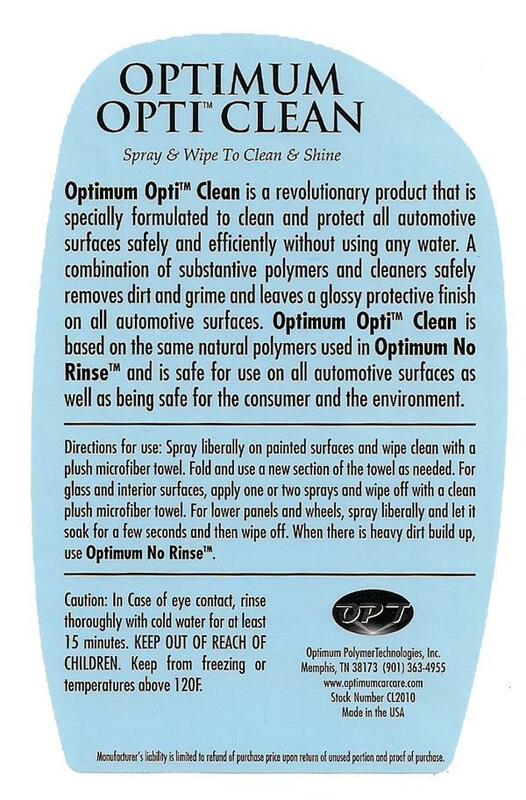 Optimum Opti Clean is based on the same natural polymers used in Optimum No Rinse and is safe for use on all automotive surfaces as well as being safe for the consumer and environment. Directions for use: Spray liberally on painted surfaces and wipe clean with a plush microfiber towel. Fold and use a new section of the towel as needed. For glass and interior surfaces, apply one or two sprays and wipe off with a clean plush microfiber towel. For lower panels and wheels, spray liberally and let it soak for a few seconds and then wipe off. When there is heavy dirt build up, use Optimum No Rinse. I have been using Opti-Clean on my cars for years when I need a quick touch up or have a bird bomb to deal with. Where it really makes life easier is when I'm traveling in my RV. Very rarely do I have access to a hose for washing. I have been able to keep the RV looking good because I carry a bin full of microfiber cloths and a quart of Opti-Clean concentrate. I wouldn't travel without it. Very good surface lubricity for dirty surfaces. Also leave good slickness. In rainy weather (PacNW) I augment (any water-less wash) by using Chem Guys Extreme Slick Synthetic detailer which not only increases slickness, but also works great as a drying agent! Benefit of drying agent is to reduce need for excessive wiping with MF towels to dry-off water-less wash in high humidity situations. I then follow with Meguiar's Ultimate Quik Wax to add even more slickness and logevity. Rain just blows off hood as soon as it hits (35 mph and up). The time savings you get from Extreme Slick acting as a drying agent pays for the extra time to apply Ultimate Quik Wax. Road splash/grime on lower panels comes off easily - reducing chances of scratching. This is a great trio for the winter/rainy season. All these products are relatively cheap, but give you high gloss and great surface slickness.